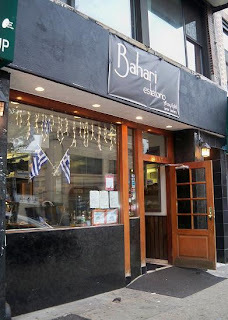 The original Stamatis restaurant on Broadway and 31st street has been renamed Bahari. The new, bigger Stamatis located on 23rd Avenue and 29th street has been there for about a year but Bahari (the old location) has only changed its name a few months ago. I inquired if the food was any different but everything remains as was--traditional Greek staples such as lamb, seafood, spinach pie and others continue to be featured. Insight into why the name changed? Well despite the same menu, the chefs are different and confusion was starting to build with respect to reservations, locations and so forth, making it easier just to change the name. How do you stay so thin while eating out at all these restaurants? Former Stamatis-now Bahari on Broadway has been a different business from the other Stamatis on 23rd Ave and 29th street for about seven years now. Many people confuse the Former Stamatis on Broadway with the Stamatis on 23rd Ave, and therefore, the reason for the name change. Bahari restaurant (former Stamatis) on Broadway has the same owners, same food and same Chef as it did for the past years.